Did you know that doing Pinterest projects is super hard once you have a baby? I totally thought I would have time during my maternity leave to make all these pretty things. SO wrong. However, I did manage to do one this week! And I did it while Holding Hudson the entire time. There should be some kind of award for that! Anyway, today I’m linking up with my girls Katie and Stephanie for Saw it, Pinned it, Did it. Here’s my pin….burlap give thanks banner….perfect for dressing up my house for Thanksgiving! 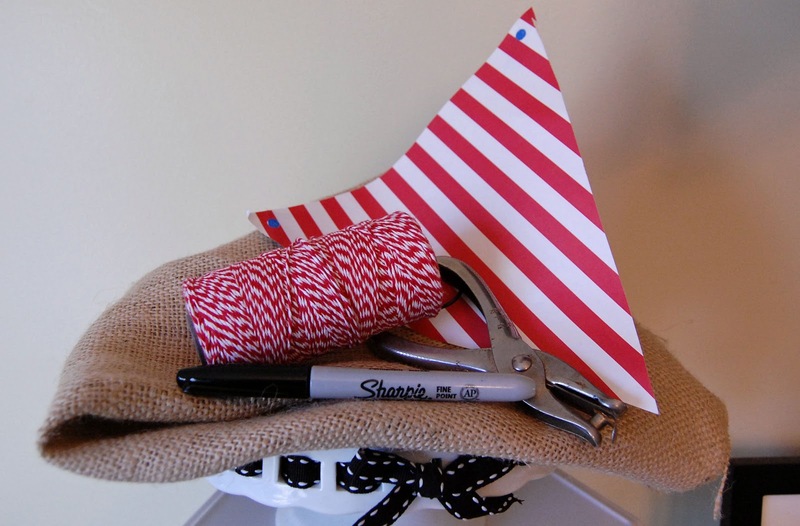 Here’s what you’ll need: Some burlap, a whole punch, a black sharpie marker, twine, and a flag template. My template was 8.5 in x 7.5 in x 7.5 in. Oh, and you’ll need fabric scissors too. I just taped my template on the burlap and started cutting. Each flag is a little different and far from perfect….but I think that makes it better and more rustic. Next I hand printed the letters on each flag with a black sharpie marker. Cheap and easy! Then I used the hole punch to punch a hole in each upper corner and used some red baker’s twine to string the flags. This was super easy and the best part is that it cost me $0 since I had all the supplies on hand. 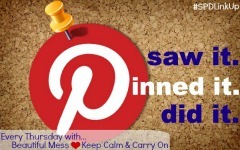 Don’t forget to link up and check out the other Pinterest projects! « Happy 2 Months Hudson! It looks great! I love how easy it is to do. 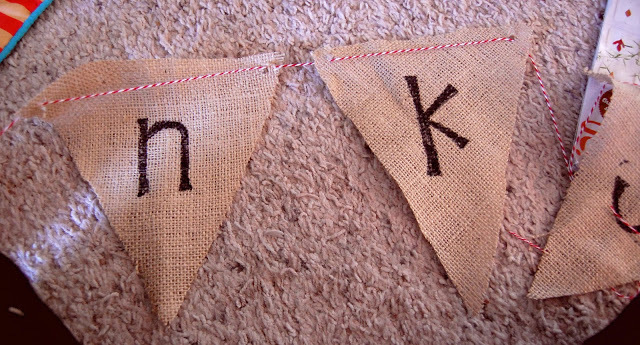 Love burlap banners! I made a burlap banner and spray painted it n sections to look like candy corn for Halloween. Super easy, super cheap, super cute! I might make one for very holiday/occasion. so so cute Julie! I actually just did a banner as well but for a baby shower. I love them! Thank you for linking up again…I love it! Really cute and your handwriting is adorable! love it!! good choice on the twine too!! Such a cute idea! Love this…might need to try for Christmas! That is so cute! I love the idea! I wish I had better handwriting! I can never get away with anything like this. 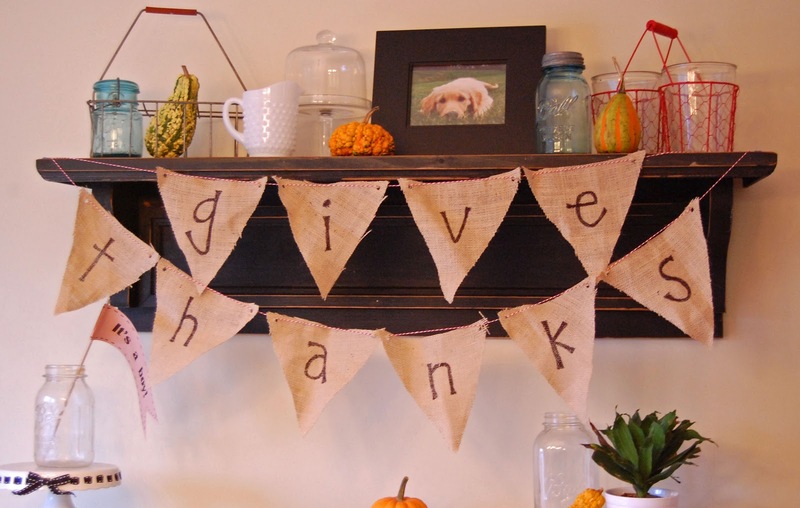 I was just at Hobby Lobby yesterday getting a few last minute things to make a Thanksgiving and Christmas Burlap Banner….I hope mine turns out as cute as yours! Awesome job! SOO freakin adorable! I LOVE IT! $0 and it looks PERFECT!! I call that a WIN/WIN my love! This is so so SOOOOO cute!!! Thanks for linking up! That is such a cute idea! You did a great job! I love that idea! 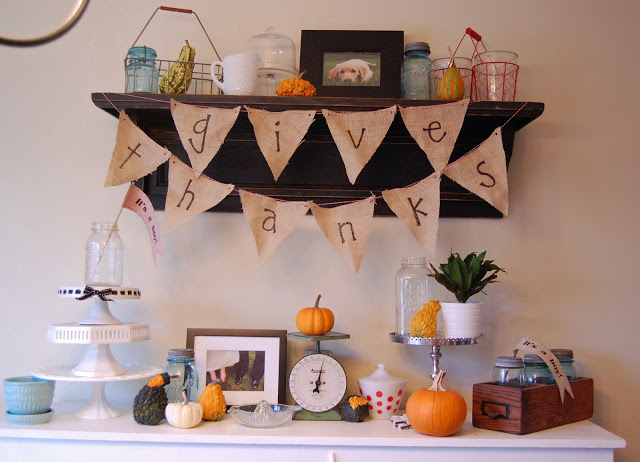 So many thanksgiving decorations are NOT cute, but something that that is subtle and adorable! I am laughing hysterically (inside because I am at Panera) while reading this post! There definitely need to be awards for what moms accomplish with babies in tow! I pinned the same banner and then was at Michaels last week and they had a "give thanks" pre-done banner 60% off–knowing I would not get it done with Kipper, I just bought it. That is the next stage of your evolution my fellow crafty-friend 🙂 Pre-baby: saw it, pinned, did it (within relative short time frame). Post-baby: saw it, pinned it, did it (longer time frame), modified it. With toddler: saw it (if I was lucky), pinned it (while I had the chance), did it (means bought it!). Can't wait to get together! What a cute idea, and holding a baby on top of that, kudos to you! I wouldn't be able to balance both! Looks great! How did you keep the burlap from unraveling, I always have a problem with that. Turned out great! And you should absolutely get an award for completing this while holding baby!!! That's impressive Mama!!! Julie I LOVE your version! The red & white string is awesome!!! Looks great! Quick question… do you know where your gallery wall post is? I used it for inspiration & based mine off of that I was going to post about tomorrow & now I can't find yours! HA! I hope that doesn't sound too confusing but, I just wanted to make sure I credited you in my post! Thanks girl!! !